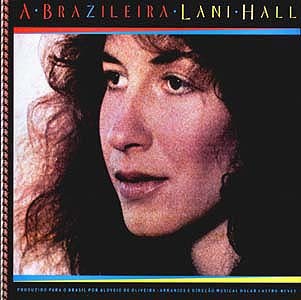 Returning to her adopted “roots,” Lani Hall and A&M released an album for the Brazilian market in 1981. The album is extremely rare in the US and is being reviewed here for the sake of completeness. Decidedly different from the two prior US “disco-era” releases, this album is much more reminiscent of the good old Brasil ’66 days. Considering that A BRAZILEIRA was never released in the U.S., it is somewhat ironic that three of the tracks are sung at least partially in English. These include the totally English “Trocando Em Miudos (Frozen Memories),” while “Eu E A Brisa (I Want To Stay)” and “Abre Alas” feature both Portuguese and English. To fans of Brazilian music, a lot of familiar composers are represented here from Jobim to Lobo to Caymmi. Indeed one of the tunes, “Casa Forte” by Edu Lobo appeared on Sergio Mendes & Brasil ‘66’s FOOL ON THE HILL album. The arrangements here by former band-mate Oscar Castro Neves are breezy and refreshing, and Lani is at home on the vocals, sounding comfortable and confident. At times, as on “Casa Forte” and “Clareana” she does both lead and backing vocals, harmonizing beautifully through overdubs. Comparisons among A&M Corner fans who’ve managed to get hold of the album have revealed that there was a fairly major defect in the pressing run for this album, as all known copies seem to have bumps in the vinyl that make it a rather noisy listen. Hopefully someday a better release will come along as Lani’s fans all over the world deserve to hear this terrific collection of tracks.